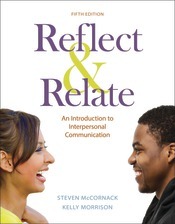 Edition after edition, distinguished teacher and scholar Steve McCornack’s Reflect & Relate helps students develop the interpersonal communication skills needed to face life’s challenges, presenting the latest theory and research with learning tools that makes this scholarship easy to understand and apply. For this edition, McCornack teams up with the ideal co-author—Professor Kelly Morrison of University of Alabama at Birmingham— whose research and teaching interests include interpersonal, gender, health, deception, and instructional communication. Kelly and Steve have team-taught Interpersonal Communication for more than twenty-five years, winning numerous teaching awards together. They are also life partners. Based on years of classroom experience and the feedback of instructors and students alike, the authors thoroughly reviewed every element of the new edition to give students the most practical path possible to better interpersonal communication. Kelly and Steve include an important new chapter on gender communication (Chapter 6), which discusses what gender is, how we "do" gender, and how the societal understanding of gender is evolving. Additionally, their completely revised culture chapter (Chapter 5) emphasizes the importance of embracing difference while dismantling cultural divisions. Updated coverage throughout the text reflects changes in the field, technological developments, and more. The book’s LaunchPad hosts numerous learning assessment tools, the eBook, videos, and a powerful new video assessment program to incorporate video-based analysis and application.